On Staten Island, there is a group of three well known restaurants, all owned by the same chef, and all very unique. Those restaurants are Bayou, Beso, and Blue. While I love all three, and plan to write about each one, Beso is by far my favorite, and has earned a four (out of five) star Baconboozer rating. While I’ve been to Beso a handful of times, this review is based on my experience there this past Saturday night. One of my restaurant pet peeves is not accepting reservations, and that is one of my few qualms with Beso (unless you’re a group of 5+). We arrived on Saturday night at about 8:30 and were told there was about an hour wait. We miraculously got a seat at the crowded bar, full of other loyal patrons, willing to wait for the experience. 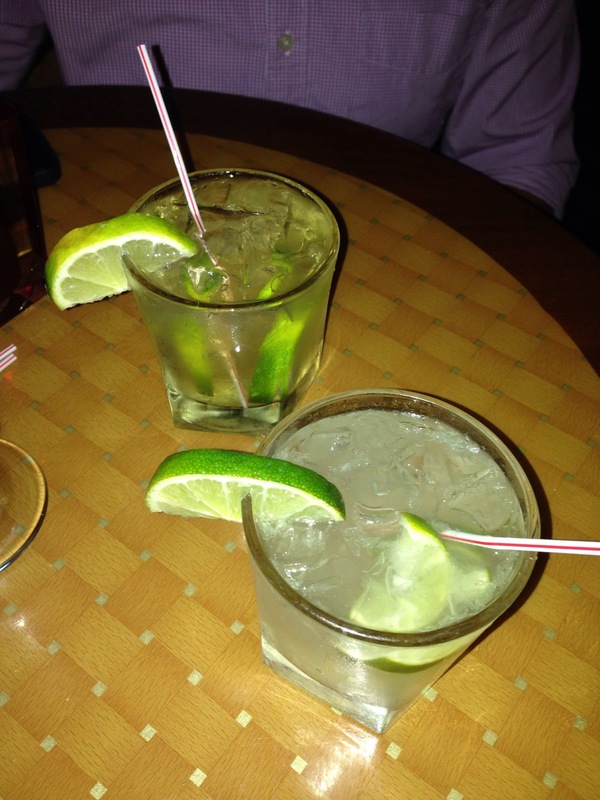 I ordered a classic caipirinha, which was strong and more delicious with every sip and Justin did the Jalapeño margarita, also great. After about 15 minutes at the bar, we were surprised that the hostess was ready to seat us, and moved into the dining room, a small and bustling area. The waitress quickly welcomed us and gave us time to review the extensive menu. As a return customer, I personally prefer to skip the large entree and salad section of the menu and focus, instead, on sharing several tapas… we were starving, so it turned into a kind of embarrassing amount of food. 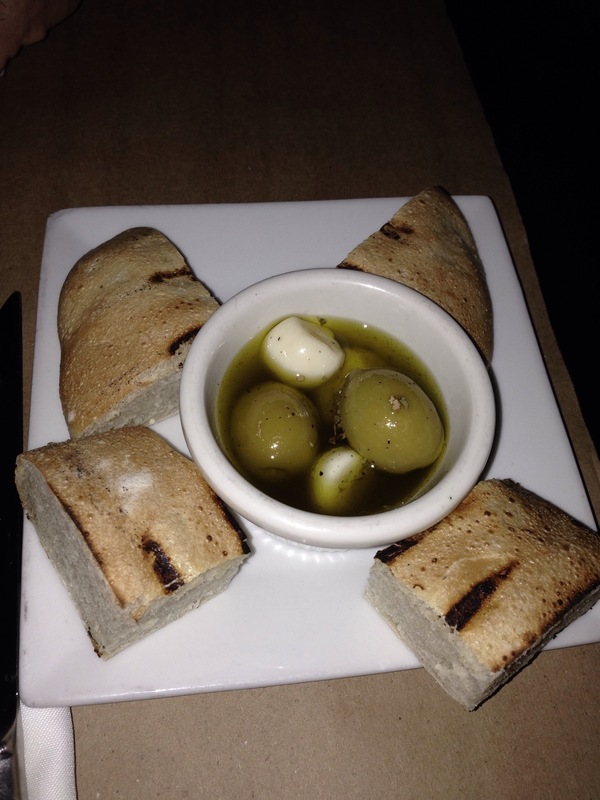 The gigantic order we were about to place didn’t stop us from also enjoying the spectacular olive/garlic infused oil and bread – warm and fresh tasting. 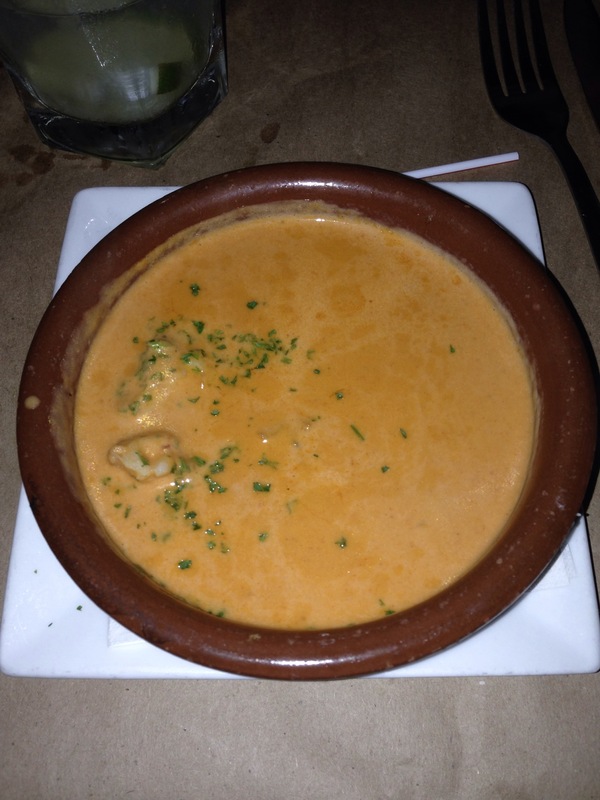 First, we decided to split a bowl of the shrimp bisque, which was outrageously good: salty and tangy and creamy – all great qualities, in my opinion. 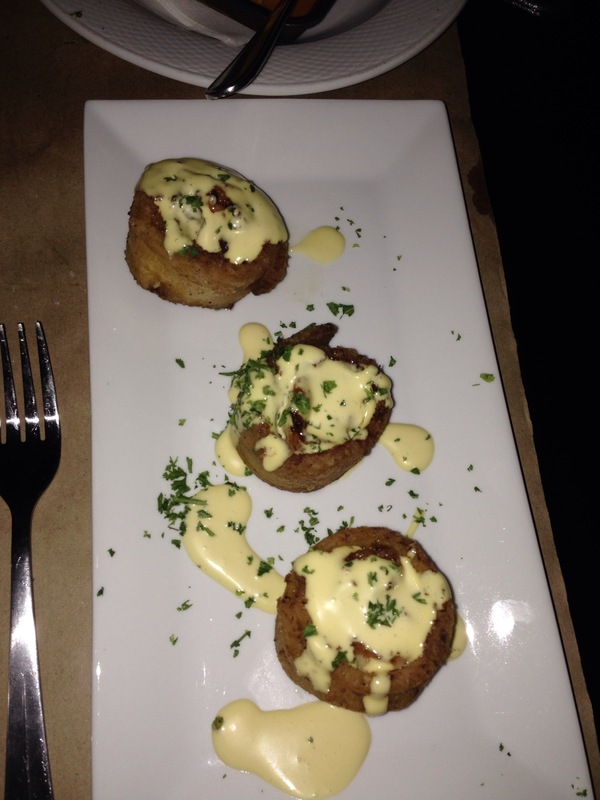 Next, we went with the “Plato Espanola” off the weekly special menu. 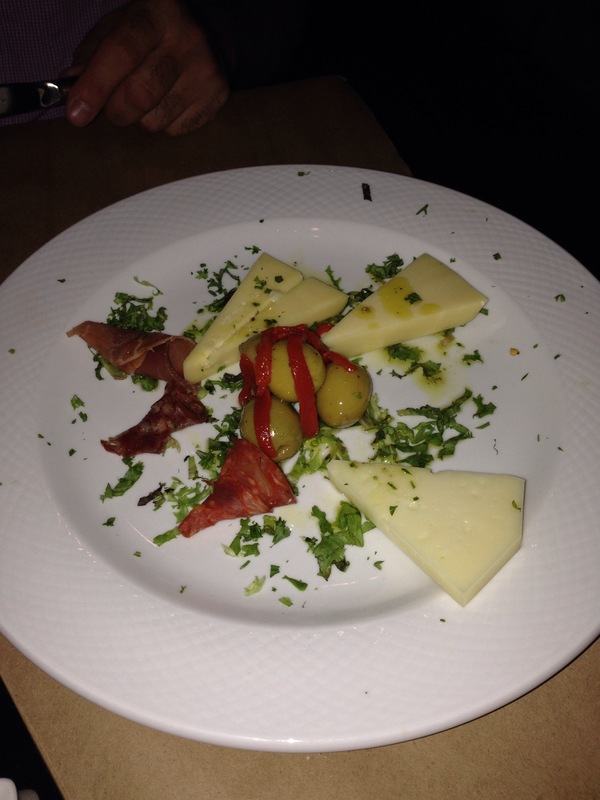 This was a platter of Serrano, chorizo, and salami with Manchego and Mahon cheeses, and was a bit disappointing. Everything tasted great but the slices of meat were tiny and the hunks of cheese were disproportionally big. We moved on to the guacamole with crabmeat, which was originally brought out incorrectly as just plain guac, but was quickly fixed with a sincere apology. 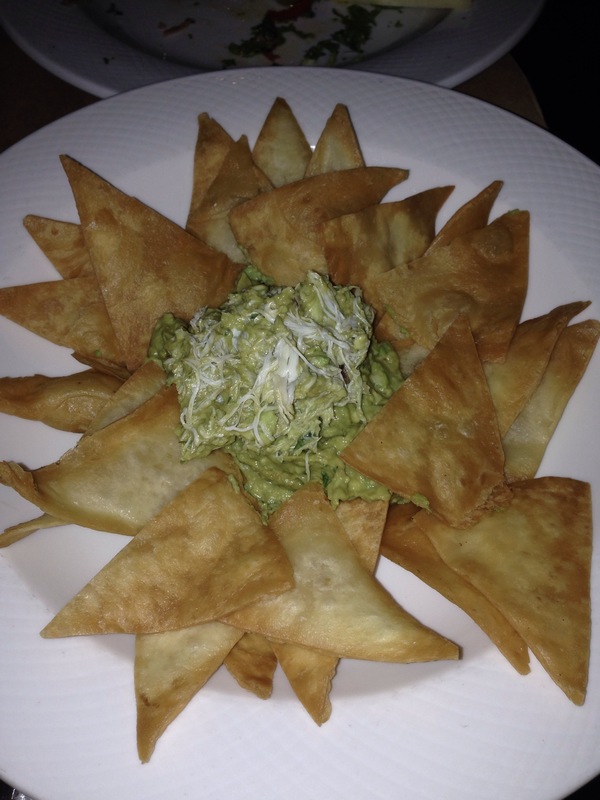 The fresh tortillas alone made this dish worth trying, but the quacamole itself was also great. 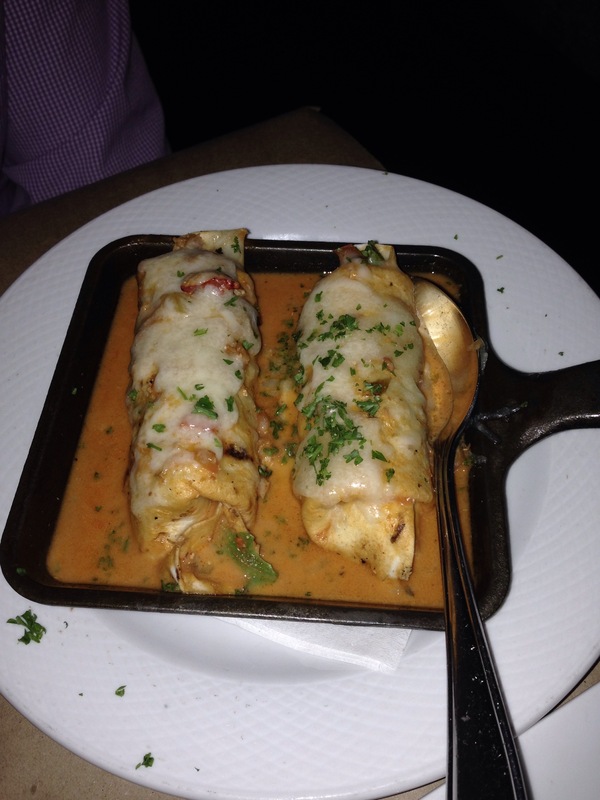 We then did the lobster enchiladas – one of my favorite dishes here. They’re full of chunks of lobster meat with a tomatoey delicious sauce. 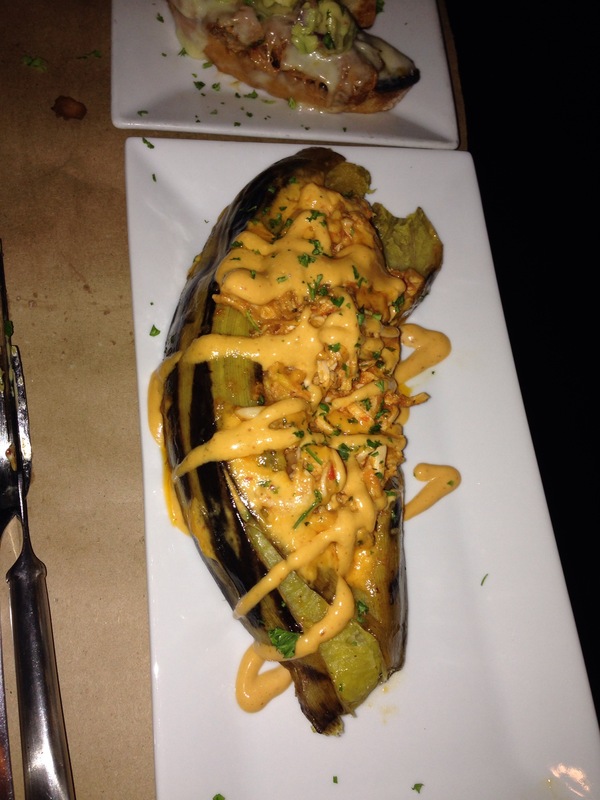 My other favorite dish came out next, the “Relleno de Gambas” – shrimp stuffed with cheese, wrapped in plantains, fried (yummm) and topped with a mango sauce. These never fail to amaze me and also immediately turned into Justin’s favorite, as well. At some point during the meal, when our first drinks were finished, we switched to sangria. They have a pretty nice variety of flavors, and we went with the special red apple cider sangria – definitely very good, but not the best sangria I’ve ever had. Above is the Maduro, a whole plantain (so sweet) stuffed with delicious shredded chicken and some kind of spicy sour cream on top. 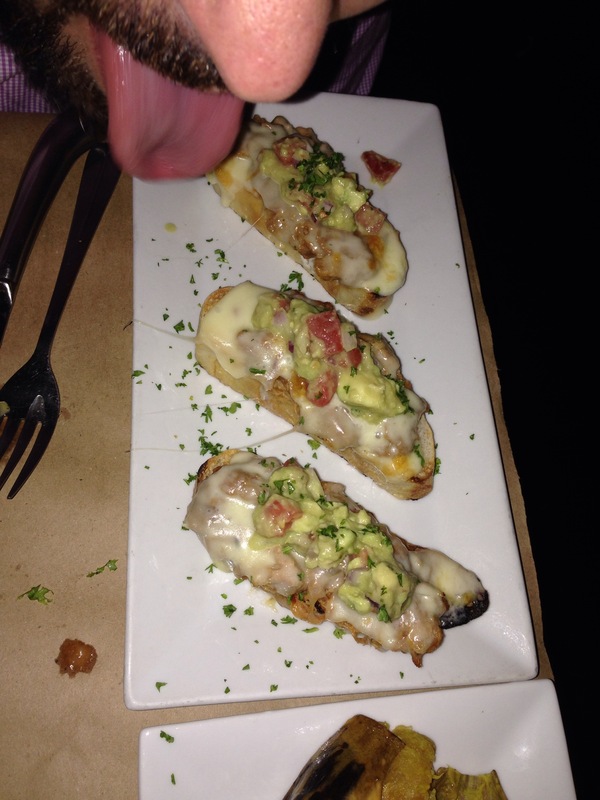 Last of the tapas was the “Montadito de pan y Puerco,” a shredded pork/garlic bread/guacomole kind of thing – awesome. And yes, that is a sneak peek of Justin’s tongue – he thought he’d get away with this. Finally, we went for dessert, because there’s always room for dessert. 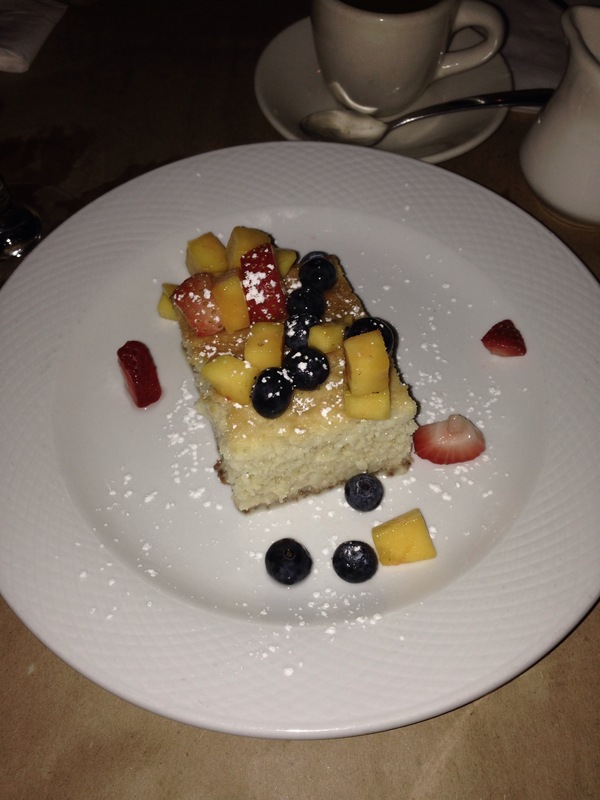 We chose the tres leches cake. Very, very good, but again not the best I’ve ever had. The restaurant managed to stay pretty packed for our entire meal. It’s loud and busy without being annoying – you can still manage a nice conversation. I love the ambiance: dark with Spanish themed art work and decor scattered all around. Service was great. I don’t mind when a waitress/waiter makes an isolated mistake (like the wrong guac being brought out – it happens), but do appreciate promptness in correcting it without any fuss or confusion. Prices are also really reasonable, with each tapa ranging between $8 and 12.